The Fulton Mansion will be closed for roof repairs starting on January 20. 317 S. Fulton Beach Rd. GPS: N28° 3' 25" W97° 2' 7.4"
The Fulton Mansion will be closed starting on January 20 to repair the roof that was damaged by the hurricane. During construction days, visitors are still welcome to visit the Education and History Center and take self-guided architecture tours of the exterior of the mansion. Admission is free, but donations are greatly appreciated! Rising above the Aransas Bay and surrounded by stately live oaks, Fulton Mansion State Historic Site is located in the resort area of Rockport-Fulton. The house must have appeared incredible in 1877, as it does today, with its mansard roof and ornate trim. Interior gas lighting, flush-toilets, and other refinements were progressive and luxurious elements for this part of Texas history. Today, visitors get a rare glimpse into the life of an affluent family in the late 1800s as they journey through the restored home, a Recorded Texas Historic Landmark and listed in the National Register of Historic Places. Learn about George Fulton’s engineering skills, take a walk through Harriet Fulton’s gardens, and hear the stories of living in a grand Victorian villa. Located behind the mansion, the Education and History Center offers interactive exhibits and a gift shop. Take a self-guided, audio tour with Texas Time Travel Tours using your mobile device's web browser (or download the iOS or Android app). 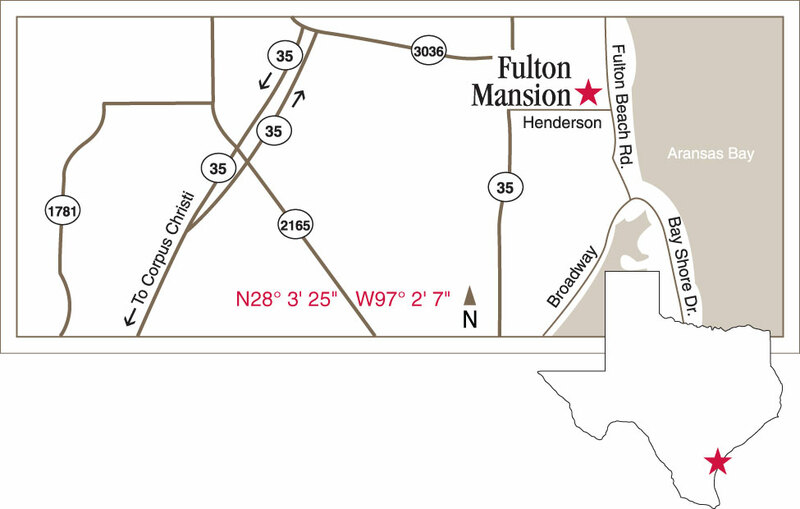 Download the Fulton Mansion visitors guide (PDF) for a snapshot of the site. Help us preserve Texas history. Donate now to support the preservation, education, and outreach activities of Fulton Mansion.